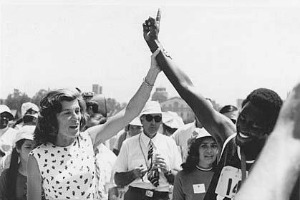 When Eunice Kennedy Shriver organized the first Special Olympics Games in 1968, her goal was to enhance the lives of people with intellectual disabilities through participation in competitive sports. It is the generous support of our individual and corporate donors that give our athletes those opportunities. Special Olympics Nebraska is a non-profit 501(c)(3) organization (Tax ID #47-0546346) that relies on donations from individuals, businesses, foundations and community events. All the money raised in Nebraska stays in Nebraska to support our program in the areas of competition, sports training, development, outreach, and family and public education. Through the generous support of thousands of individual and corporate donors, life-changing experiences happen each and every day for people with intellectual disabilities. Special Olympics does not charge athletes to train and compete in local activities, so it can be a challenge to provide everyone with a chance to benefit from Special Olympics. Call (800) 247-0105 or (402) 331-5545. Please call between the hours of 8:00 a.m. and 4:30 p.m. Central Standard Time. Be sure to check with your employer to see if you can double your donation for Special Olympics Nebraska.